Two days ago we celebrated our four year wedding anniversary, and I couldn’t let the day pass without writing a quick few words about how extra special our celebration is this year. If you would have asked me on our wedding day, if we would have a child four years later, I would have said the likelihood was 99%. If you would have asked me if we would be homeowners here in the Bay Area; I would have said, “you’re crazy! !” and that there was a <1% chance of that happening. 99% of me is really excited for this next step. I can’t wait to share this home with our family and friends, and finally be able to host our parents comfortably…without them sleeping on a couch or blow up mattress. I can’t wait to host holidays. The most important piece of furniture to me was buying a dining room table that could extend to fit our whole family. I also can’t wait to watch Gio grow up in this house. He is going to have so much fun exploring the yard and playing in the play house…and helping me pick our produce (or maybe just eating it, haha). The previous homeowners left artichoke bushes, apple trees, blueberry bushes, avocado trees, and some other kind of fruit tree in the yard! It truly feels like the quintessential California home. Moving somewhere new means leaving the street we’ve called “home” for almost 5 years. Previous to living in our current apartment, we lived right down the street in a one bedroom, until I found out I was pregnant. You can read about that move here. This block has been my comfort zone for the past 5 years. I walked this neighborhood many, many times ….from nightly walks with Kendrick, to daytime runs, to slow waddles when I was pregnant, to our first family walk postpartum, to numerous stroller walks/naps when Gio was a couple months old, to wagon rides after he turned one, to walking with him beside me now…. how things have CHANGED. Oh how I’ve loved this neighborhood; it will always be where Gio first grew up. We’ve made so many good friends, and although we won’t be moving far, it still is sad we won’t be within walking distance anymore. Words of wisdom from my husband that speak so much truth about life. We must continue moving forward. Growth happens when we pass through the uncomfortable. It’s temporary. It doesn’t last forever. And I’ve found some of the best things in life came from me making a decision to be uncomfortable. SO, here’s to NEW beginnings. TO moving forward. And to having a place called HOME. Wow it’s been a while since I’ve sat down to write a blog post. I’m feeling a little rusty to be honest! While writing has always been a passion of mine, it’s definitely fallen on my priority list since becoming a mom. However, whenever I do make time to write it feels so good! Especially if I know that what I’m writing about can benefit someone else out there. As you may know, or not know, my husband and I are owners of a fitness studio, called Studio K-Fit here in Redwood City, California. In addition to personal training, we offer our signature small group workout called K-FIT HIIT; a high-intensity cardio class. Participants have the choice of doing a 30 minutes or 60 minutes option (K-FIT HIIT 30 & 60) We’re the only studio in the Bay Area that offers a low impact, high-intensity cardio class utilizing both the Water Rower and the Airdyne Bike. What I love about these classes, bias aside, is they can be modified for practically anyone at any fitness level. Personally, I’m not a huge fan of running. Professionally, I’m still not a huge fan because of all the strain it puts on your joints. After I became pregnant, it gave me a good excuse to stop running, but I didn’t want to lose my cardio stamina either. The Water Rower and Airdyne Bike were the perfect equipment for me; and with some modifications during the core segment, I was able to continue working out up until my son was born. Once I was cleared by my doctor postpartum, I jumped back into K-FIT HIIT classes. Working out during those early months didn’t pose a problem, because I could just bring my son along with me (perks of being a Studio owner) and he would sleep during it. As he got older, and he started staying awake longer, I was presented with a new set of challenges. My once easy going baby no longer could sit through a class without needing something from me. Plus, our Studio is not designed to be “baby friendly”. Although we are the owners (and can essentially do what we want), I didn’t want to be inconsiderate to our clients who come to the studio to escape the craziness of their lives. Many of them are parents themselves, so they’ve dealt with their fair share of child meltdowns. There’s a time and place for everything… but I quickly realized I had to find an alternative to bringing Gio to the Studio. I heard about Fit4Mom through a non-parent friend who had another parent friend with a baby born two weeks after Gio. She told me that their Stroller Strides class was held down the street from her house and that I should check it out. My first Stroller Strides class I attended, my son was about 3 1/2 months old; and it felt like an accomplishment just getting out of the house on time! The class begins with a warmup together, introducing ourselves and our babies, and sharing a fun fact about ourselves. Then, the group splits off into two smaller groups…those who are walkers, and those who are runners. I chose to walk and followed the other mamas to another location in the park where we would complete a strength set. The only equipment we use during class are resistance bands and yoga mats. The instructors do a really great job of utilizing park benches, sidewalks, fences, basketball courts, walls, and fountains to perform our exercises. For example…doing step-ups on a park bench, or pushups off a sidewalk curb. It’s all about being creative. We usually complete four or five strength stations around the park, and work our cardio in by walking or running to each station. All the while, the babies are getting the royal treatment. Not only do instructors lead the mamas, they also entertain the kids! At each station, instructors will either sing nursery songs for the babies, read a book aloud, or when babies get fussy and cry, they’ll rock/push the stroller back and forth so the mom can finish her exercises. It’s a full on show! In addition to the workout, there’s scheduled activities for the kids after class each week. Some of these things include arts and crafts; like making a sensory bag, finger painting, or making play dough. Other activities include story time at the library, meeting at a coffee shop, or a trip to the playground. This is what makes Fit4Mom truly unique and special in my eyes. They go beyond building a fitness empire, to building a strong community of moms. Their slogan, “strength in motherhood” couldn’t be a more perfect description of the values and ethos which they embody. *It should also be noted that this group is totally breastfeeding friendly! As a new mom, I was nervous to go out places when I knew my plans would overlap with when I had to feed Gio. That’s what I love about this community, they just get us! They know that we have other priorities and that being a mama always comes first! Honestly, there was a period of a few months when Gio and I couldn’t make it to class, because he was taking his morning nap at 9:30am. Some moms may not find that an issue, but for me personally, I knew that I would be stressed out if I didn’t let him nap, so that was a sacrifice I had to make. Overall, I can not recommend Fit4MOM enough. I’ve met so many wonderful moms through class, and Gio’s met lots of new friends! It’s something we look forward to each week, and Gio really enjoys watching me exercise. He’s been known to even laugh when I’m doing pushups, burpees, or jumping jacks. I still have yet to figure out if he’s laughing with me, or at me….HA. If you live in the Bay area – Fit4Mom has locations on the Peninsula, San Mateo, Fremont, and Danville. Gio and I personally attend class at Burgess Park on Mondays and Wednesdays, and at Burton Park on Fridays. If you attend one of those classes, come say hi! We’d love to meet you. Anyone can try their first class for free; just go to: sfpeninsula.fit4mom.com. Sara and Michele, the Owners of Fit4Mom SF Peninsula, were gracious enough to offer a special discount especially to Mrskfit readers. *For 20% OFF a 10 class pass or monthly membership for Stroller Strides and Stroller Barre classes; use code: SSKFIT. *For 20% OFF a 10 pack of Body Back Drop-in classes, use code: SSKFIT. *For 30% OFF the Body Back Transformation program, use code: TRANSFORMKFIT. *Use code: F4MKFIT to receive an unlimited Stroller Strides and Fit4Baby pass for $75/month. All smiles at our morning workout! Jordan and I started Stroller Strides around the same time and our babies were born only two weeks apart! Thanks for reading and keep on, keeping on mamas! Well, here we are. ONE year old! As I write this, I remember at this time last year, I was in the hospital waiting for my contractions to start. I was admitted to the hospital on December 5, because my water broke at home, but Gio wasn’t born until 7:45 pm on December 6. You can read more about Gio’s birth story here. I intentionally planned to celebrate Gio’s birthday early because we chose to have him dedicated at our church the Sunday after Thanksgiving. Both of our parents were planning to be in town, so I thought why not lump the celebrations together and do one, BIG joint celebration! Donuts have always had a loving place in both my husband and I’s heart. After moving to the west coast, it became a silly obsession of ours to always get Dunkin Donuts when we traveled back east (they don’t have any where we live!). Especially when my sister and brother in law were living in Boston, there was practically a Dunkin Donuts every corner! Kendrick and I are able to buy the French vanilla coffee (our favorite) at our local grocery store, but as for donuts, we had to drive to Half Moon Bay (40+ minutes away) to satisfy our craving. That is until we discovered an amazing donut shop within walking distance from our house (dangerous!) called Donut Delite. I feel like I’m cheating on DD by saying this, but their glaze donuts are seriously heavenly. (And better than DD in my humble opinion). SO, all that to say, when I came across the donut 1st birthday theme on Pinterest, I knew I had found a winner. A lot of my inspiration came from a fellow blogger who executed the same birthday party theme for her son earlier this year. Unlike many other donut party pictures I saw, where there was a lot of pink, purple, inflatable donuts, and other brightly colored tableware and decor; the way Julie did it was simple, not overdone, age appropriate, with just the right pop of color. Take a look at her party here. The donut printables and favor tags were available for FREE on Julie’s site. She had also linked to the donut balloons on Amazon, and other party decor she used. I ended up making a lot of the decor myself, since I had the time and wanted to save money. I bought a 1 inch round paper punch, and punched out confetti for the tables, and also used it to punch holes in the paper donuts I made. I made Gio’s “ONE” banner for his highchair, and bought the white tassel banner at Target. I’ll link to all the decor throughout this post. It was a lot of work pulling everything together, and I couldn’t have done it without my amazing family – my mother and sister in law have impeccable taste and stellar decorating skills, so they really helped pull my vision together. My mom and sister did a lot of the work behind the scenes with all the food prep and plating, and clean up after the event. It takes a village, right?? We served fruit skewers with strawberries, pineapple, and donut holes on the ends. OF course I had to serve bagels too since they went with the “donut shaped” food theme. And the beloved glaze donuts. I also made homemade “donuts” that were egg-free since I have a friend with an egg allergy. Also, I knew not everyone likes donuts so I wanted there to be something for everyone. I bought Pumpkin Bread mix from Trader Joe’s, and subbed flax seed for the egg, and baked them in my donut pan. I rolled them in cinnamon sugar after they cooled and they were the perfect treat! I also made banana bread “donuts” and just followed a banana bread recipe and baked them in the donut pan, and topped with powdered sugar. “Donut Dough” (Play Doh) & “Donut seeds” aka fruity Cheerios. Guest Book: “If You Give a Dog a Donut”. I had family and friends sign this book to have as a sweet momento. A friend let me borrow her IKEA highchair and Happy Birthday banner. This donut smash was the best idea ever! SO much easier (and cleaner) than a smash cake but just as fun! I weigh 24 lbs 1.6 oz; and I am 2 feet 8 inches tall. My favorite foods are: avocado, eggs, strawberries, oranges, pasta with pesto, bagels and cream cheese; but I’ll pretty much eat anything that’s put in front of me. Thanks Mommy and Daddy, I love you! We love you too sweet GIO! HAPPY 1ST BIRTHDAY! It is 7:22 am on a Tuesday morning, and Gio is taking his first nap; he was up at 4:30 am. I’ve been wanting to share some of my favorite books and podcasts lately, because they have been so encouraging to me, especially in this season of motherhood. What I particularly love about reading books by other moms or listening to podcasts hosted by moms, is that often times I find myself saying, “ME TOO!”. That is what I love about this new community I am in, we just GET each other. All other societal divides are put aside when you meet another mom. You have a connection and bond that no other person can understand. No matter what stage of motherhood you’re in, all moms have been through whatever it is you are going through, and that to me is SO comforting. That mom who lets her child eat food off the floor? …FINE. That mom with the crying baby in the checkout line at Target…I’VE BEEN THERE. PSA: THIS IS A JUDGMENT FREE ZONE MAMAS. We all have to make decisions that are best for our family, for our child, for ourselves…so, how we choose to parent may look a little different. But, no matter what, we should extend the same love and grace that we would want to be given; because at the end of the day…we fed, clothed, changed, played, bathed, and kept another human being alive; and that deserves some praise! Coffee + Crumbs– I learned about this podcast from another mom who posted a link to the show on Facebook. After listening to the first episode, I realized that all 3 moms who host the show all live in California! I felt even more of a kindred to these mamas who were living and raising kids on the west coast. 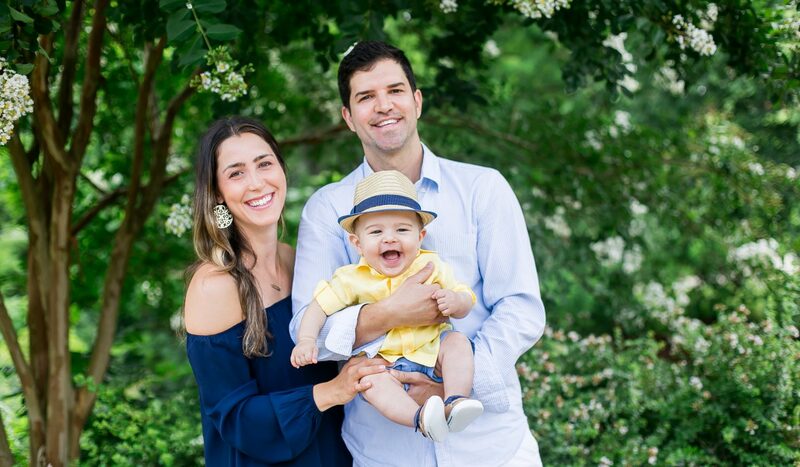 The Goal Digger Podcast– This is not particularly motherhood related, but I’ve been following Jenna for a while now, (since before I was pregnant), and she is such an inspiration. From starting her own photography business, to educating others on how to start a business, to launching her own podcast for creative girl bosses; she is such an authentic, hardworking gal. She has also been very open about her personal life and struggles, including two miscarriages in the past year. Right before I found out I was pregnant with Gio, she shared that she had a miscarriage. Although I’ve never met her, I grieved alongside her as she shared her walk down this road. I’ve been continuing to follow her journey and no matter what you are going through in your life, she is an encouragement for all of us. My favorite episode recently is: #74 “How to Stay Creative and Tackle Your Next Project” with author Emily Freeman. I resonated with so much of what Emily said and it was actually from listening to this episode that I felt encouraged to start blogging again. (I had been on a little hiatus since April). Of Mess and Moxie – by the hilariously funny Jen Hatmaker. I literally laugh out loud when I read her books. Now that I am a mom, I can relate to her so much more. She is just honest and real y’all (she lives in Texas, which is rather fitting for her big personality). I also recommend reading, “For the Love“. *Check out Jen’s interview on the C+C podcast ! A collection of short stories complied by the women of the Coffee + Crumbs podcast. An easy, encouraging read. I started crying 2 pages in. Lots of good reminders — I did a lot of highlighting! Wow my little baby is 10 months! My last monthly update was when he was 4 months…and I don’t nearly have the time to catch you up on everything since then; but, I would like to share what’s been happening recently. Gio learned to crawl! It started out as a scoot/belly crawl at the beginning of September, and moved in to a full on crawl on all fours. Now it seems like he can get across our little apartment in under a minute (CUE: SHOCK FACE). Heaven help me when the boy starts walking…thank goodness we live in California where the weather is pretty much perfect everyday; I have a feeling we’ll be spending a lot of time outside! Gio also learned to pull up this month. It just happened in the past week actually, and all he wants to do is grab things at a height and pull them down, especially the remote control. If he eyes that thing, he is SO determined to get it that he’ll risk being thrown off balance; resulting in some bumps to the head. We had to put up a baby gate/superyard, and the same day I was going to order one from Amazon, a mom in one of my Facebook groups posted one for FREE. ((I had no idea that baby gates can cost over $100!!)) Not really a fun purchase to make, so I was stoked I could get it second hand. Although some things have gotten easier when traveling, like not having to stop as much to breastfeed or change his diaper, it has also gotten harder because he’s now growing and moving and doesn’t like to sit STILL! He really doesn’t like his car seat and 50% of the time will make a fuss when I put him in it. We lucked out on the drive down and I was able to sit up front with Kendrick while Gio napped a bit and entertained himself for the most part. We also broke out “The Wiggles” Nursery Rhymes video on YouTube when we needed to…on vacation anything goes! Another fun part of Gio growing up is having him join us at the table when we go out to eat. He looks so cute and grown up sitting there in the high chair. Let me tell you, the kid LOVES to eat. Like father, like son. He pretty much will eat anything I give him; correction, he WILL eat anything I give him. We ordered him a side of broccoli when we went to lunch in Santa Barbara, and he gobbled it up. He also had his first taste of pao de queijo (gluten free Brazilian cheese bread). If you’ve been a loyal follower, one of my very first posts I shared with you that I made Kendrick a homemade Brazilian dinner – complete with pao de queijo! Read more here) . I want to write a separate post on our trip to Santa Barbara, but in case I forget, I HAVE to share with you our most favorite restaurant we discovered. It’s called the Brasil Arts Cafe, and of course, the menu offers a variety of authentic, Brazilian food AND smoothies, acai bowls, salads, and some typical American fare. We loved it so much we ended up going THREE times while we were there. Anyway, this past month has been so much fun and each week with Gio is a blessing that I never take for granted. He laughs at the words “BOO” and “MOO”. A sure way to get him to laugh is when I demonstrate the “cat/cow” move like you do in yoga. He ALWAYS laughs when I add the sound effects while doing this. Oh Gio, I love you so much!! That smile can brighten any day! This is a picture of my husband Kendrick around Gio’s age…what a resemblance!! Gio’s first trip to the zoo!